Beaumont specialized in blurring the line between reality and fantasy, and this, his first Zone script, is no exception. 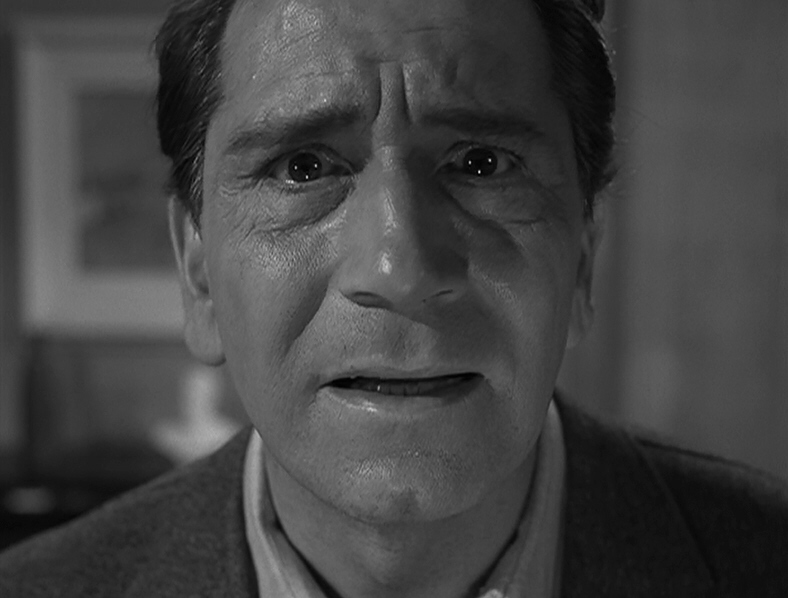 Serling would resort to such story-telling devices to teach us a lesson. Beaumont just wanted to scare the pants off us. The story of Edward Hall, and his fixed belief that if he falls asleep he’ll never wake up, is well-known even to casual Zone fans. The flights of his overactive imagination are fascinating. 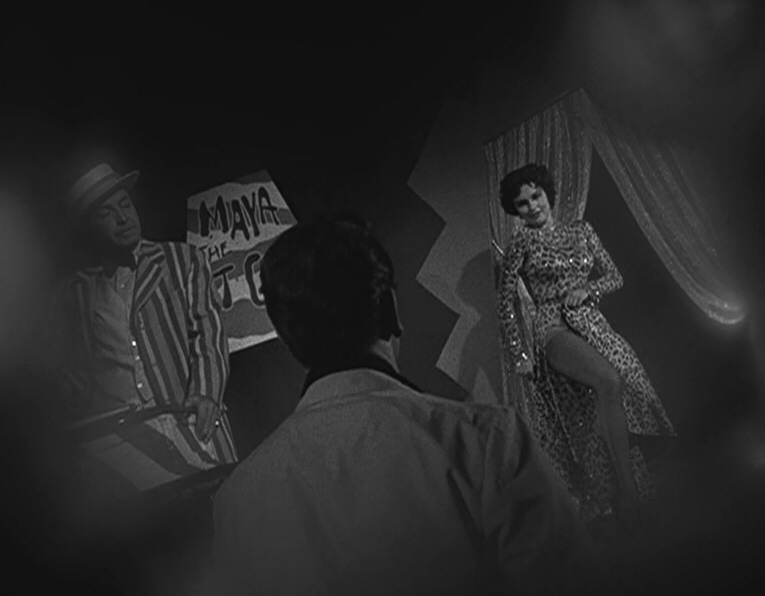 His unsettling trip to a bizarre carnival, and his ill-fated attempts to evade the seductive ways of Maya the Cat Woman, make this one of the most visually striking episodes in the entire Zone canon. Beyond the surface question of reality versus dream lies another, less-explored theme: the allure of danger. When Hall is explaining his problem to the psychiatrist, we see he’s a man unable to control his attraction to activities that, he insists, will kill him. He’s convinced, beyond all reason, that during long night-time car rides someone will appear in the back seat if he stares in the rearview mirror long enough. Yet he keeps looking. The excitement of a carnival could put a fatal strain on his system. He goes anyway. Watching Maya dance, then riding the roller-coaster, might kill him. He does both. This dual-minded attitude toward danger is a well-known human impulse. Over a century before Beaumont wrote “Perchance to Dream,” Edgar Allan Poe wrote “The Imp of the Perverse.” In it, a man commits the perfect murder, but finds himself inexplicably tempted to confess. He finally does — and winds up on Death Row. A better-known example occurs in Poe’s “The Black Cat,” where a man has walled up his murdered wife in the basement. The police search, find nothing, and turn to leave. At which point he boasts of the fine construction in his basement — and raps on the wall. Unfortunately for him, the cat he had accidentally walled up with his victim picked that moment to screech. “Perchance to Dream” may be less gruesome, but it’s no less memorable. Like a roller coaster, it’s easy to regret — but hard to turn down. Posted on 06/13/2011, in Twilight Zone and tagged Charles Beaumont, Twilight Zone. Bookmark the permalink. 19 Comments. Right — like a dream, when you think about it. It’s unrealistic in that it’s highly stylized. And yet it feels real. It’s a disorienting combination, really. That’s probably what makes certain dreams so frightening. Yes, the camerawork and the music are terrific. They pull you right into the story. Like Edward, we’re alarmed by danger … and yet we’re also attracted to it. Beautifully done. Everything works in this episode.